A globe-trotting writer visits the West Coast city for the first time and wonders why he waited so long. 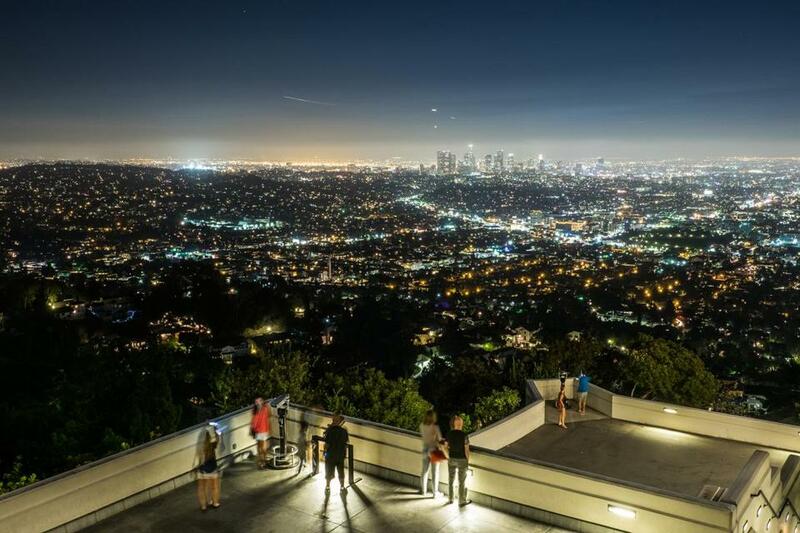 Visitors admire the view of Los Angeles from the Griffith Observatory. LIKE MANY NEW ENGLANDERS, I’ve had a reflexive prejudice against Los Angeles, which I’ve always envisioned as an ugly maze of freeways where everyone eats egg-white omelets and avoids calling anyone back. In the last 20 years as a writer, I’ve had occasion to visit nearly every major US city (not to mention most of the capitals of Europe and quite a few in South America and Asia), but I’ve always consciously managed to avoid Los Angeles. That is, until recently, when a book tour took me through the city. And in just 48 hours, I’m not ashamed to say, I fell in love. First off: Some stereotypes are true. There are a heck of a lot of freeways, and the health-conscious thing is just out of control. I lost count of the number of places I saw that peddled cold-pressed — never fresh-squeezed — juice. But driving around LA’s highways for two days, just reading the names of the boulevards — Sunset, Hollywood, Wilshire, Santa Monica — gave me a tangible thrill to realize how much a part of our cultural psyche this city is, not to mention how gratifying it was to see how they all fit together. I cued up a Spotify playlist of Angeleno songs and found myself thinking things like So that’s why it’s a long day livin’ in Reseda and That’s why all the vampires walkin’ through the valley move west down Ventura Boulevard. I STARTED MY COURTSHIP in downtown LA, where I stayed at the elegant Omni Los Angeles. It’s a far cry from the burned-out reputation downtown has languished under for years (LA’s own “skid row” is four blocks away) and which the city has been gamely fighting. From my upper-floor window, I can see some of the victories of that battle, including the shimmering stainless-steel facade of Disney Hall and the 25-foot-tall sculpture of airplane wreckage outside the Museum of Contemporary Art and, rising between them, the newest star of downtown LA — The Broad Museum. The Broad itself is tailor-made for a selfie backdrop, with an alabaster concrete honeycomb over a glass enclosure. 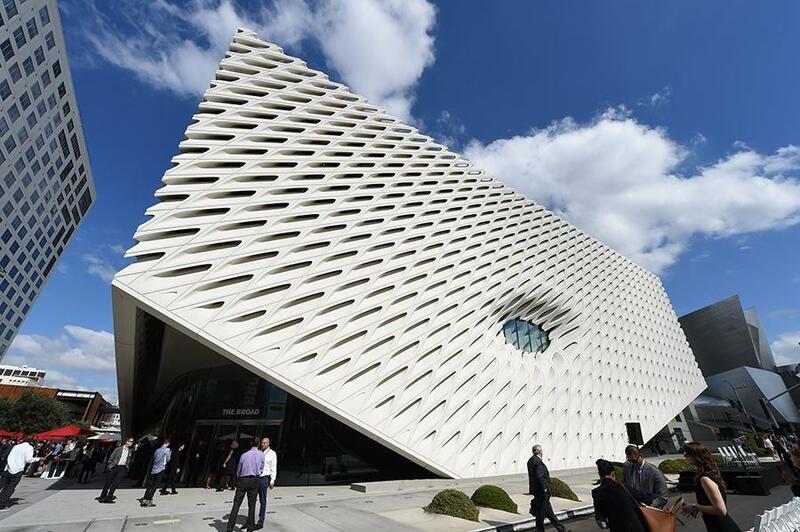 A gift to the city by philanthropist Eli Broad (pronounced with a long O), the $140 million museum is free to the public — but admission is currently booked weeks in advance. The building itself is tailor-made for a selfie backdrop, with an alabaster concrete honeycomb over a glass enclosure filled with 2,000 works of art from all the brand-name artists of the last 50 years: Warhol, Rauschenberg, Basquiat, Haring, Sherman. Fitting for a city of spectacle, the galleries don’t do subtlety. Visitors can confront the enormity of Jeff Koons’s shiny blue balloon dog before plunging into the Infinity Mirrored Room, a fun house of LED lights by Japanese pop artist Yayoi Kusama, into which visitors are admitted one at a time for 45 seconds of psychedelic satori. When they stumble out into the reliable California sunshine, they can find relative tranquillity down the street at the gardens adjoining the Richard J. Riordan Central Library. There, the tables of Cafe Pinot nestle among trees romantically hung with paper lanterns and overlooking a view of the LA skyline. The food is California French, with standouts like a mustard-basted rotisserie chicken and mussels with chorizo and saffron-white wine broth with crunchy grilled bread for dipping. 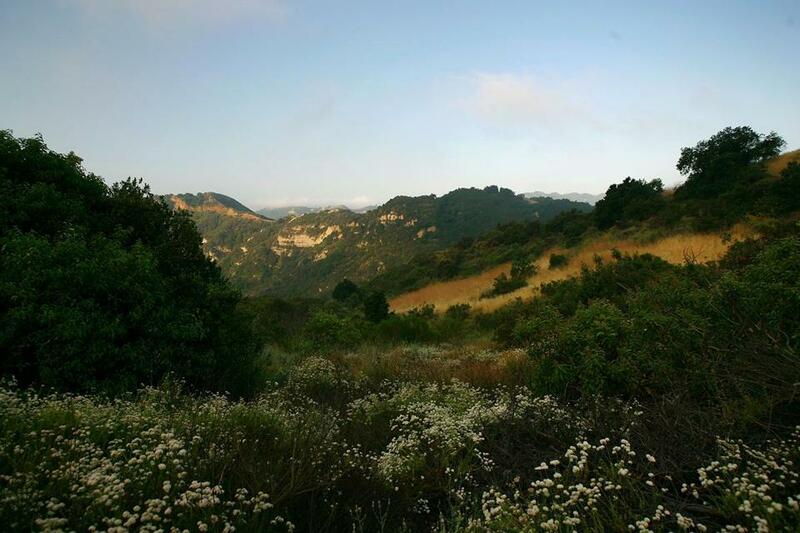 The hills above Santa Ynez Canyon beckon in Topanga State Park. Which brings me to another reason to fall in love with LA: The food just tastes better. Not sure if it’s the more stringent food-safety regulations in California or the proximity of fresh vegetables or just the emphasis on healthy ingredients, but even the average chicken sandwich is a notch above comparable fare on the East Coast. The next morning, I stop in for a salmon and sour cream crepe at Solar de Cahuenga, a cafe on the outskirts of Hollywood, and find myself licking my lips and contemplating ordering another. I wash it down, of course, with cold-pressed juice in a Mason jar — some kind of beet-and-citrus concoction that leaves me humming with energy and just maybe makes me start to understand the difference between it and fresh-squeezed. I’LL NEED ALL THE ENERGY I can get for my next destination. Careering around the Hollywood Hills, I head west to Topanga Canyon, an enclave for actors in the 1920s that became an alt Shangri-La by the 1970s. Now the area is more hippie-chic than hippie. The boulevard up from the valley weaves around craft galleries and artisanal bakeries festooned with colored Christmas lights and Tibetan prayer flags as it climbs up to Topanga State Park — at around 11,000 acres, the largest wilderness area within any US city. I park at Trippet Ranch — an 80-acre plot once owned by a female rancher in the 1920s and ’30s, now part of the park — and start climbing a 2-mile trail to the top of the ridge, passing through a lovely scrub oak forest alive with birds flitting among the tree branches. Breaking out of the woods, the last half-mile of the trail is straight up over dusty scree and chaparral, and I’m panting in the hot sun, nervously eyeing my diminished water bottle. Thankfully, the trail levels off at the top, and I turn around for my reward — waves of unspoiled ridges stretching in every direction and, toward the west, a shiny blue sliver of the Pacific Ocean poking out over the farthest ridge. Maybe it’s the heat or the thrill of accomplishment, but the view has me swooning. It’s the sort of beauty I never expected to see in LA — certainly not a half-hour drive from downtown. 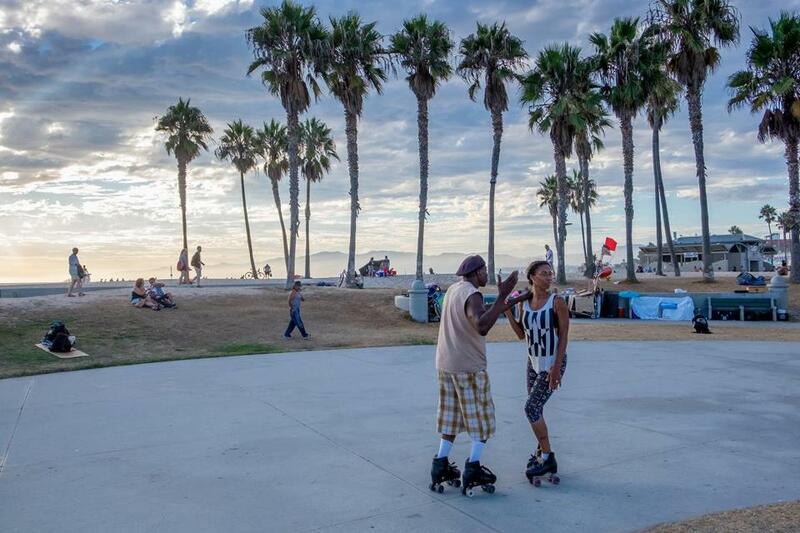 Watch the sunset (or the people) at popular Venice Beach. The sun is heading down the sky by the time I climb back to my rental car to follow it in the direction of that blue sliver. Slicing into the canyon and taking a hard left at Santa Monica Pier, I reach Venice Beach — a place that smacks me with a solid sense of deja vu from all the times its curving concrete paths and palm trees have played backdrop to Hollywood meet-cutes. For sheer people-watching, it doesn’t disappoint. A Jamaican street performer walks on shards of broken glass to entertain German tourists, muscleheads do pullups to the sounds of thrumming bass, and beach-bronzed teens giggle past stalls selling sunglasses and booty shorts. 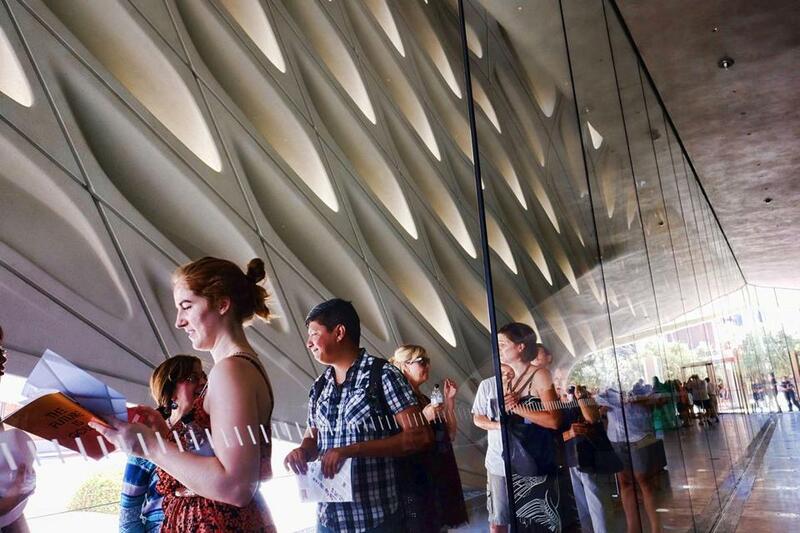 Visitors wait in line to enter The Broad Museum on opening day. Michael Blanding is a Boston-based writer whose most recent book is “The Map Thief.” Send comments to magazine@globe.com.